Download nominations for the 72nd British Academy Film Awards in our handy printable BAFTAs ballot. Our latest download for you is for the 72nd British Academy Film Awards. 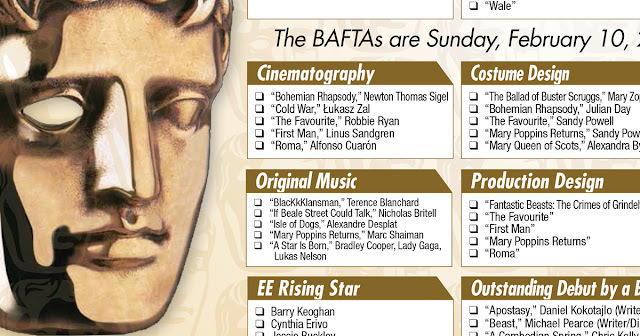 Find all of the nominations here in our handy BAFTAs Ballot. Download the ballot, print it out and pass out during your party (go here to download the PDF). It's in glorious colour. 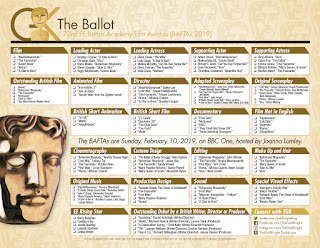 Download a printable BAFTAs ballot. Share your predictions with us by commenting on this post, sending us a reply on Twitter or writing on our Facebook wall. Share pictures of your ballots with us on social media! When nominations were announced Jan. 9, “The Favourite” was quite literally the favorite, nominated in 12 categories. The film is nominated for Best Film and Outstanding British Film. Olivia Colman is nominated for Leading Actress for her role as Queen Anne, and Rachel Weisz and Emma Stone are both nominated for Supporting Actress. With 12 nominations, it could easily a great night ahead for “The Favourite.” We'll see what happens on Feb. 10. Save printer ink by downloading our black and white version. 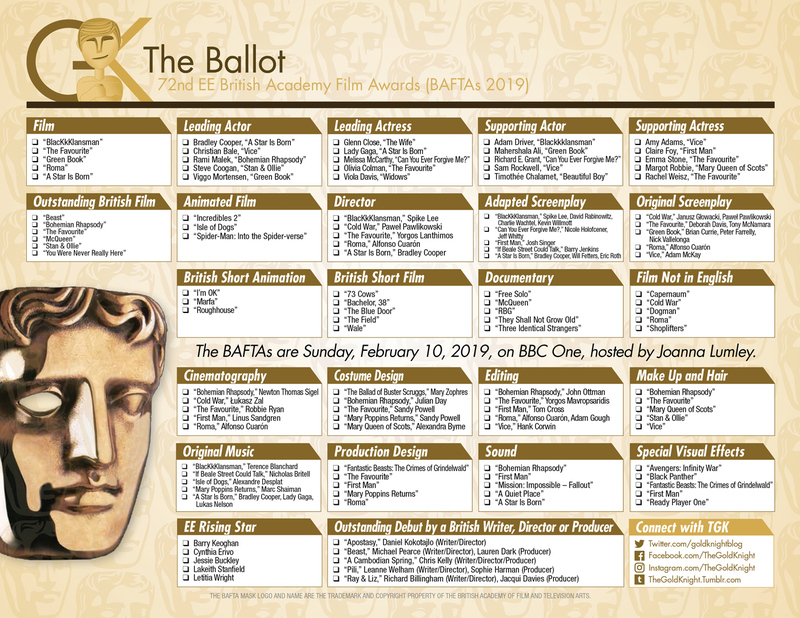 Find the full list of nominations on the official BAFTA website. The 72nd EE British Academy Film Awards (BAFTAs) are Sunday, Feb. 10, at the Royal Albert Hall in London. BBC America is scheduled to broadcast the ceremony in the United States. Joanna Lumley will host the ceremony.